Free ultra-fast drug/chemical ID and method 905 drug content uniformity test is available. Please call +1 408-868-7707 for details and appointment. 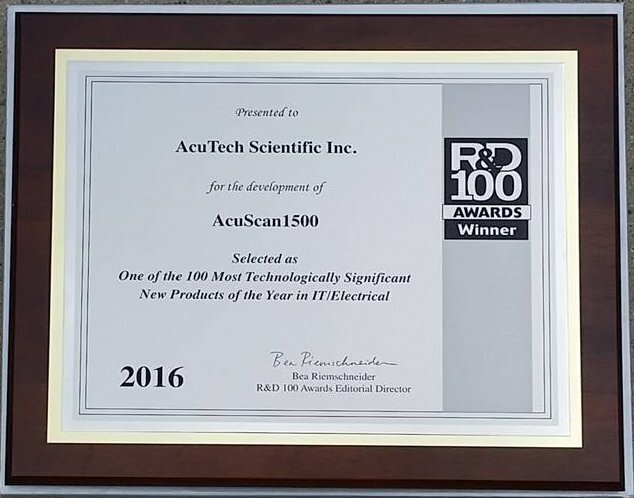 AcuScan1500 received 2016 R&D 100 Award. These prestigious “Oscars of Invention” honor the latest and best innovations and identify the top technology products of the past year. has joined that list of achievements and made history by winning the R&D 100 Award! 2. AcuScan200 is a Raman Spectra Identification system for Real-Time On-line Chemical Reaction Monitoring Using AcuScan1200 Handheld Raman System with Software Data Analysis Driver. The above two new products completed our Raman series product portfolio to include now: Truly light weight handheld SERSTECH100, AcuScan1200 Handheld Raman Spectra Identification system, AcuScan 200 a Raman Real-time On-line Chemical Reaction Monitoring Using AcuScan1200 Handheld Raman System with Software Data Analysis driver, AcuScan1350 for Gem stones and geological mineral identification system, and fully automated AcuScan1500 system for 21, 30, 96, and 384 micro-well multiple sample chemical Raman spectra identification and quantification. Now you are able to utilize this Award wining Raman products for Laser auto-focusing, multiple sample reproducible identification and quantification analysis.